The government extended further relief to farmers, hit hard by plunging prices, removing export restrictions on all pulses on Thursday. NEW DELHI: The government extended further relief to farmers, hit hard by plunging prices, removing export restrictions on all pulses on Thursday. Union IT and law minister Ravi Shankar Prasad said that the Cabinet Committee on Economic Affairs (CCEA) had decided to do so to enable farmers to get more remunerative prices for their produce. The current crop year has seen farmers battle steadily decreasing prices, especially in pulses, as ill-timed imports, unseasonal heavy rains and a sharp increase in production have influenced the market. The New Indian Express had reported last month that the majority of kharif crops have seen prices plunge significantly below the minimum support prices (MSP) set by the government. The All India Kisan Sangharsh Coordination Committee, a coalition of around 180 farmer associations, recently pegged losses incurred by growers due to the drop in prices against the MSP this kharif at Rs 35,968 crore. Removing export restrictions, however, is expected to siphon surplus production out of the market and prop up prices of pulses. 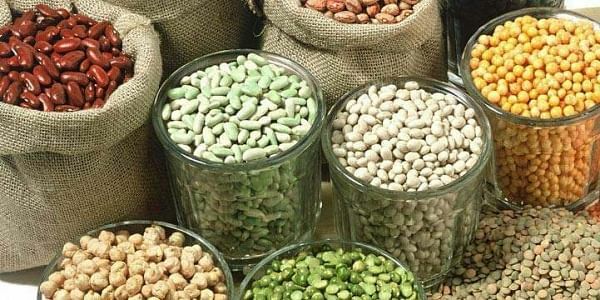 The domestic production of pulses stood at a record 22.95 million tonnes in the 2016-17 crop year (July-June) as against 16.35 million tonnes the previous year. The country also imported about 5 million tonnes of pulses last fiscal. Besides removing restrictions on exports, the CCEA also empowered a committee headed by food and public distribution secretary to review export and import policy on pulses and examine more measures such as quantitative restrictions, prior registration and changes in import duties depending on domestic production and demand, local and international prices and global trade volumes.